Your most valuable asset isn’t your house, car or retirement portfolio. It’s your attention. Most knowledge workers spend their day frantically hopping between meetings, emails, phone calls and social media. But that’s not the best way to stand out in the modern economy. Emails are necessary, says author and professor Cal Newport. They’ll keep you from getting fired. But they won’t get you promoted. In fact, his Deep Work Hypothesis states that the ability to do deep work is becoming more rare, yet at the same time, more valuable. That means if you can train your mind to resist the common distractions we all face, you’ll become more valuable in the workplace, whether you’re self-employed or traditionally employed. The problem, however, is that most of us are intimidated by deep work. We welcome distractions from difficult tasks that take a toll on our brain power. #1: Recognize that every hour you spend on “shallow work” is an hour that you’re not spending on deep, rare, valuable work. #2: Don’t just focus on “cutting” — chopping email, cutting social media. That’s a good start, but it’s not enough. Instead, ask the question: “What’s the ideal deep work vs. shallow work ratio?” — how many hours should I spend on each one? — and structure your workday accordingly. For example, you might decide to spend your time 50/50 on deep vs. shallow work. If that’s your ideal arrangement, you might spend the first four hours of your workday — 8 am to 12 noon — invested in deep work. Then take a break for lunch, and spend the second half of your workday — 1 pm to 5 pm — answering emails, participating in meetings, etc. Alternately, you could break up your deep work into chunks — 8 am to 10 am, then 3 pm to 5 pm. Use the 10 am – 3 pm stretch for the necessary shallow work of emails, meetings and phone calls. As a third option, you might block off 2.5 days per week for deep work, and devote the other 2.5 days to shallow work. However you arrange the workday, the most important takeaway is that you consciously choose your ideal deep-to-shallow ratio, and then structure your time accordingly. #3: Let go of the “Any Benefit” decision-making model, in which you’ll invest time into any social media platform, app or tool that may provide some benefit. Recognize that many tools might provide benefits, but each tool contains a serious time and energy cost. Therefore, you shouldn’t adopt a new tool, app or social media platform unless you’re convinced it’ll create demonstrable value. Deep work also isn’t something that you cram into the margins of your life. To the contrary, focusing on deep work allows you to boost your productivity at work and feel more fully present at home. 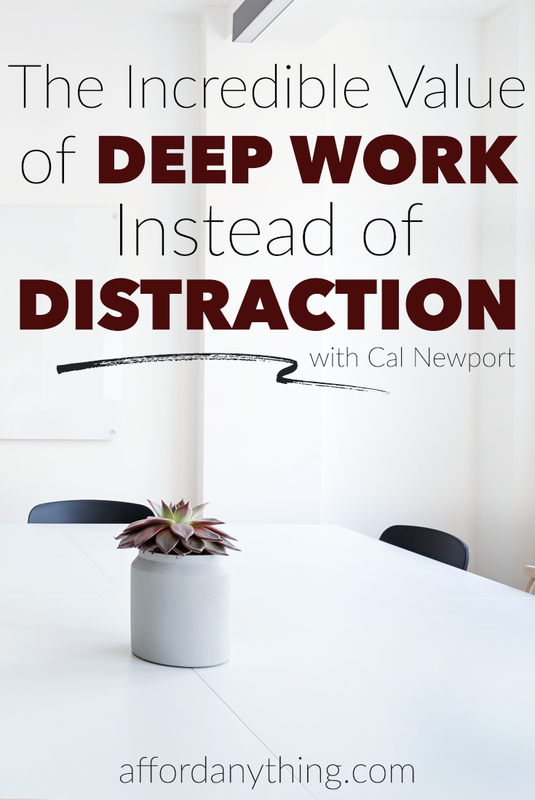 Newport discusses the concept of Deep Work, and shares tips on how to apply this to our lives, in today’s podcast. Enjoy! Deep work is even more important for freelancers and entrepreneurs who need to manage their time well enough to produce great quality work for their clients. But in order to get paid, you need to spend time invoicing clients, which can easily turn into a distraction. Enter: Freshbooks, an online platform featuring an easy, intuitive invoicing system designed for solopreneurs, freelancers and self-employed hustlers. They’re also an enthusiastic supporter of this podcast. Try them for FREE — no credit card required! — by visiting Freshbooks.com/paula. When they ask how you learned about them, please mention the Afford Anything podcast. Thank you for your support! Great interview Paula! Really enjoyed this topic. I had heard about Cal and some of his books before but had not prioritized reading his books. I just went up to my library (online) and reserved his Deep Work book! Thanks, and keep up the good work! Hi Paula! I follow your podcast form the beggining and I find it very inspiring and it gets better and better 🙂 Love your voice, keep up the great work! That was one of your best interviews yet. It was obvious that you were interested and your questions were on point. “Workflow Engineer” it’s going to be a thing. As a DevOps Engineer I can see this improving workplace happiness and fulfillment. With continuous deployment and the significant increase in software release velocity experienced as a result there’s more job fulfillment. Getting your code into production at the speed of development increases your feeling of contribution. Maximizing deep work and flow could have an even greater impact on fulfillment and productivity. I actually have some workplace product ideas related to this. Yes, there’s definitely products that could assist Workflow Engineering. Great interview. I listened to it twice. Paula, you were totally spot on with the interview questions and follow ups. That is not a trivial accomplishment, but you (and your engineer?) made it sound easy. I have reserved Cal’s books at the local library (sorry Cal – saving $s means library for me) and will be putting together a brief presentation for my team at work. Thanks for bringing his valuable thoughts to me. Best wishes, Daniel.